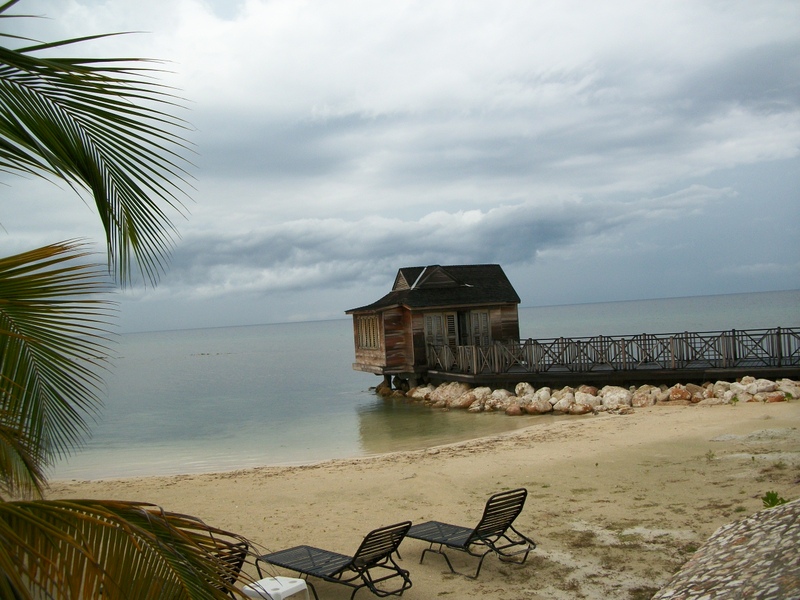 The Beautiful Island of Jamaica in Style…Once You Go, You Know! This wonderful display greets you in the lounge for Half Moon Resort and Spa at the Sangster International Airport in Montego Bay, the smells and scents prepares you for what you will experience when you arrive at the resort which is only 15 minutes away from the airport. Aw, you can feel yourself begin to relax and release even before you leave the airport, amazing. At Half Moon Resort and Spa, you can have your massage take place in the Sea Side Cabana for a small additional fee of only $35.00US . Close your eyes and imagine laying on the soft massage table and you have the wonderful scent of the candles to fill the cabana but now you also have the sounds of the waves to lull you into a very peaceful state of mind. Aw, I can just see it now, total peace and relaxation is what you will have while your Spa Specialist is releasing all the tension from your body. 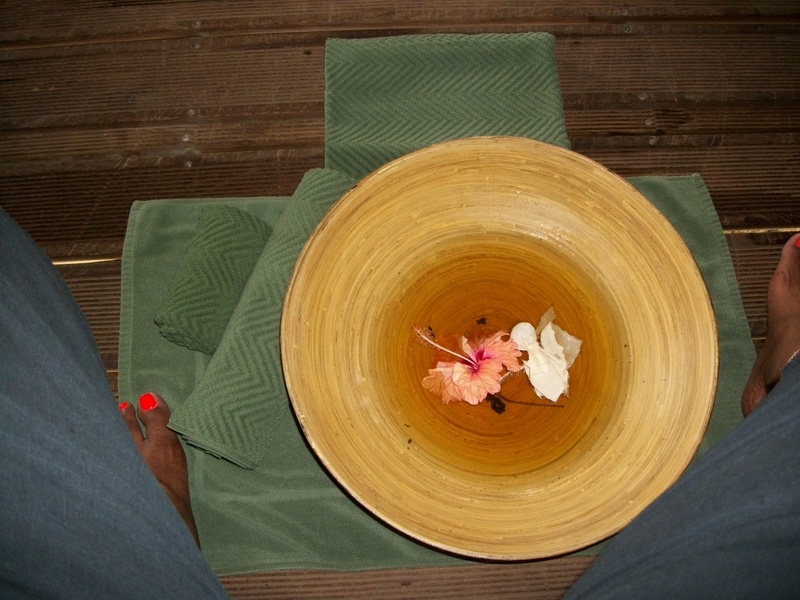 Fern Tree Spa embraces the century old traditions from Jamaica by using ‘bush’ remedies to heal and nurture the body. Traditionally, healing medicines using local indigenous ingredients such as fruits, herbs, flowers, bark and roots have been used, and at Fern Tree Spa they continue this wonderful tradition. 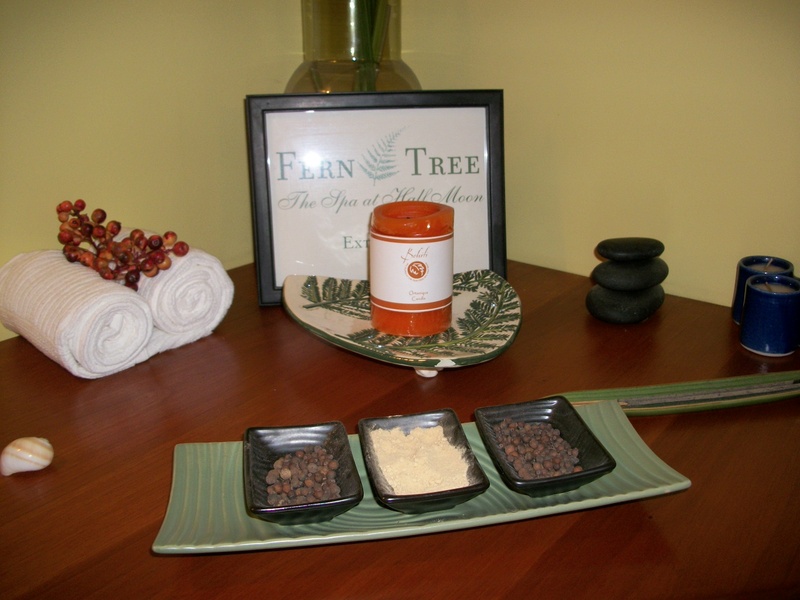 Fern Tree Spa employs a Spa Elder who is a natural extension of this healing tradition and this has become the foundation for the spa therapies and philosophy at Fern Tree Spa. The Spa Elder has created healing rituals, natural products and recipes to improve health and well being, and deliver rejuvenating results. 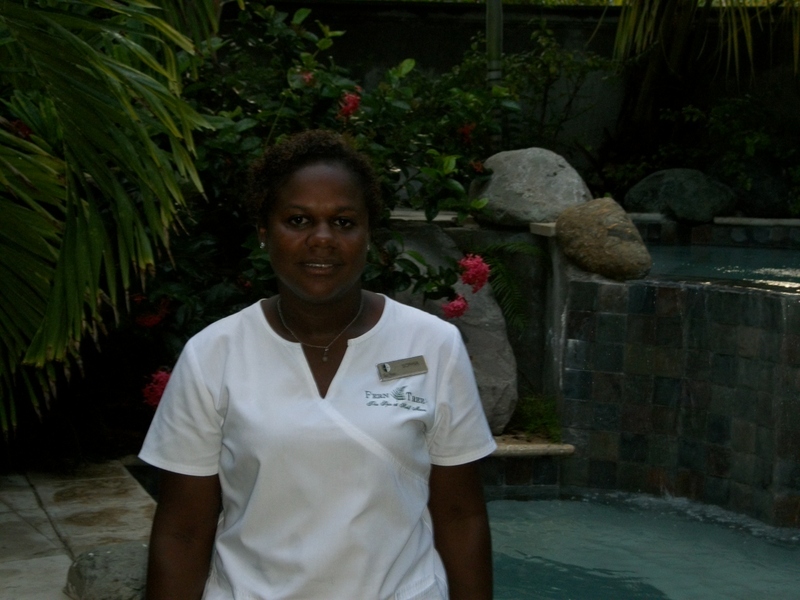 Sophia was my Fern Tree Body Therapist and I have to tell you she is one of the best at Fern Tree. The massage that I received was one of the best massages I personally have ever had. She took her time to relax ever part of my body and the pressure was just right and her hands are perfect for the job she does. 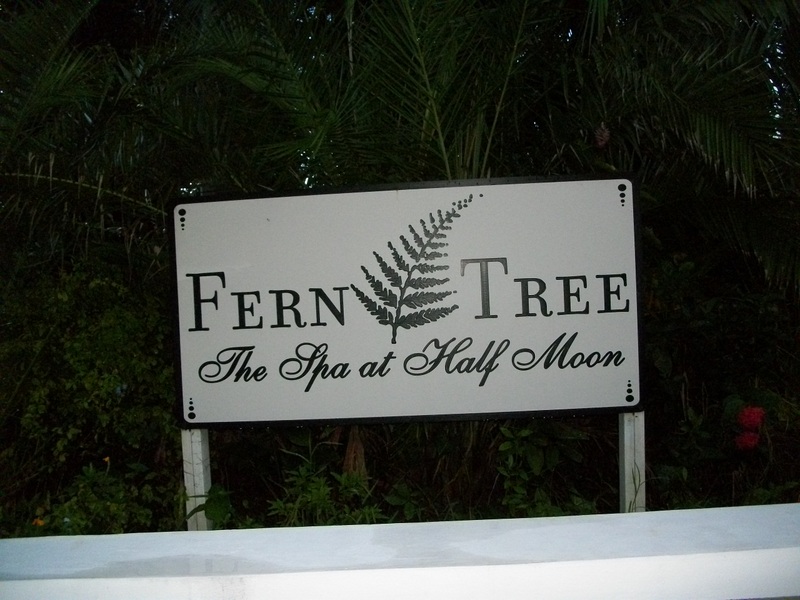 Fern Tree Body Therapies focus on traditional Jamaican plant and herbal remedies in addition to innovative body care treatments. When you leave Fern Tree Spa you will free 100% relaxed and rejuvenated, ready to deal with any and everything that comes your way. The Arrival Ritual…created for all Signature Treatments, guests are welcomed with a ceremonial foot bath. 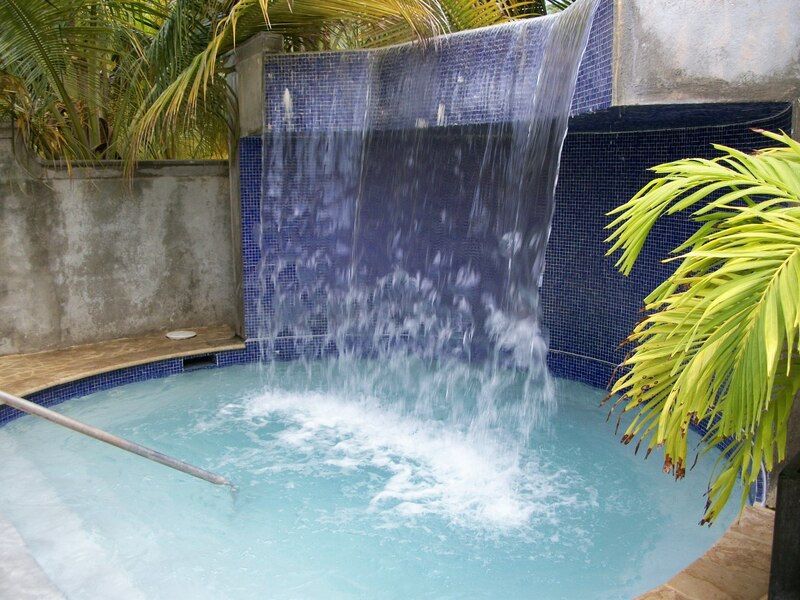 You are escorted to a reception area to sit and relax, enjoy traditional Jamaican Bush tea and receive a foot bath infused with calming lavender water or rejuvenating nutmeg oil. The foot bath really and truly gives you the feeling of being special. Sophia took her time to massage my feet and really pampered me with this treatment. The scent coming from the water was very calming and enjoyable. The Couples Massage is a true gift to give yourself as a couple. Fern Tree Spa has a package called…Get Your Groove Back Couples Package…it consist of…a 50-minute Couples Massage, Soak for 2 (in the Get Your Groove Bath Double Tub) , Champagne for 2 and fresh fruit served to you while you soak together in the tub…heaven to say the least! The Half Moon Spa Cottage offers a private refuge for spa guests or couples. The Spa Cottage can be used for specialized spa packages, couples services or reserved by the hour for a truly indulgent spa experience. The Spa Cottage includes a private soaking tub, massage treatment area, relaxation area, patio with a outdoor hot tub and shower and it also gives you access to the spa pool. 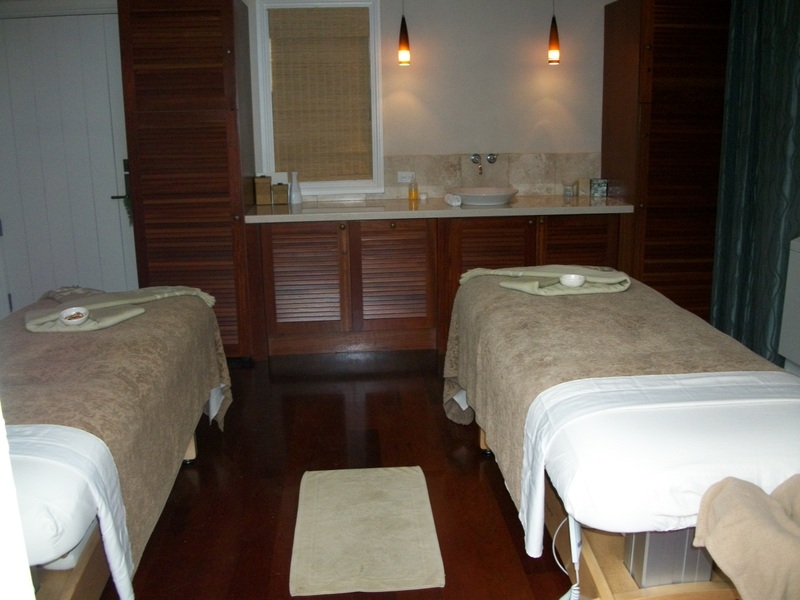 To rent the Spa Cottage at Fern Tree Spa the rate is $250.0US per hour. So now that I have tempted you with just a very small portion of what you can experience when you book your vacation at Half Moon Resort and reserve your spa experience, it is time to give me a call at 310-722-3099 or send me a email at Info@carterelitetravel.com to get your getaway booked and secure…. 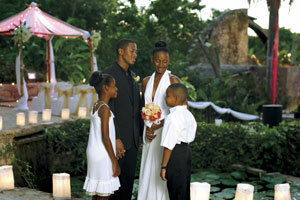 A marriage in Jamaica is easy and legally recognized in the United States. We will share some of the legal guidelines for getting married in Jamaica – be sure to give yourself plenty of time to prepare all of your documents, and work closely with not just me (your travel professional) but also the resort’s wedding coordinator to make sure everything is in order before the big day. We don’t want anything to disrupt your extra special day. These requirements apply to American citizens; if you are a citizen of another country, be sure to check with your country’s embassy for any special requirements you may need to get married in Jamaica. Listed as one of the “World’s Best” Resorts in the Caribbean by the readers of Travel & Leisure Magazine, Half Moon is the perfect wedding and honeymoon destination. Pristine, white-sandy beaches, a choice of exquisite settings for ceremony and reception, beautifully-appointed guest rooms and suites, most with fantastic views of the sparkling Caribbean, world-class golf and tennis and our exclusive spa combine to make for the Caribbean’s most complete resort. Selecting just the right location for your ceremony is one of the most important decisions you will make when planning your wedding. By taking advantage of Half Moon’s picture perfect seaside location, lush landscape and warm tropical breezes, brides can design the ultimate one-of-a-kind wedding that will be cherished by all who attend. The Beach Gazebo – Surrounded by the azure sea, this intimate Gazebo is ideal for the most romantic wedding ceremony. Reserve at dusk and enjoy the brilliant colors of a Half Moon sunset. Maximum 15 people can be seated here. Oleander Terrace – A beachfront stone terrace with panoramic views of the Caribbean. Reserve at dusk and enjoy the added bonus of a fiery sunset. 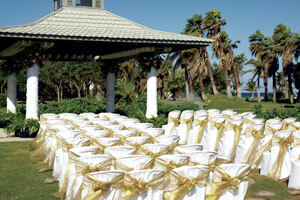 The Oleander Terrace is ideal for wedding ceremonies and cocktail receptions for up to 200 guests. The Lily Pond Wedding Gazebo – Framed by magical fountains and surrounded by a tranquil lily pond, this gazebo provides the perfect setting for a wedding celebration with up to 200 guests. 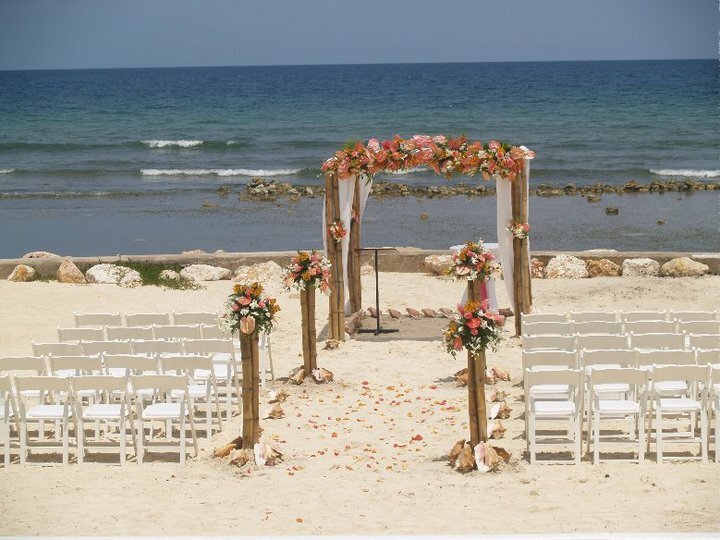 The Sunrise Beach – If barefoot elegance is what you wish, than Sunrise Beach is the ultimate beach location for your special day. This location is ideal for up to 200 guests. The Royal Pavilion – One of Half Moon’s most traditional locations, the Royal Pavilion offers expansive views of the Caribbean and it is ideal for weddings large and small. This space seats up to 80 guests. The Sugar Mill Restaurant – Say your vows on this 200-year-old terrace that overlooks an original watermill. This is one of the resort’s most romantic and unique settings for an intimate outdoor wedding ceremony. Seats 140 guests. 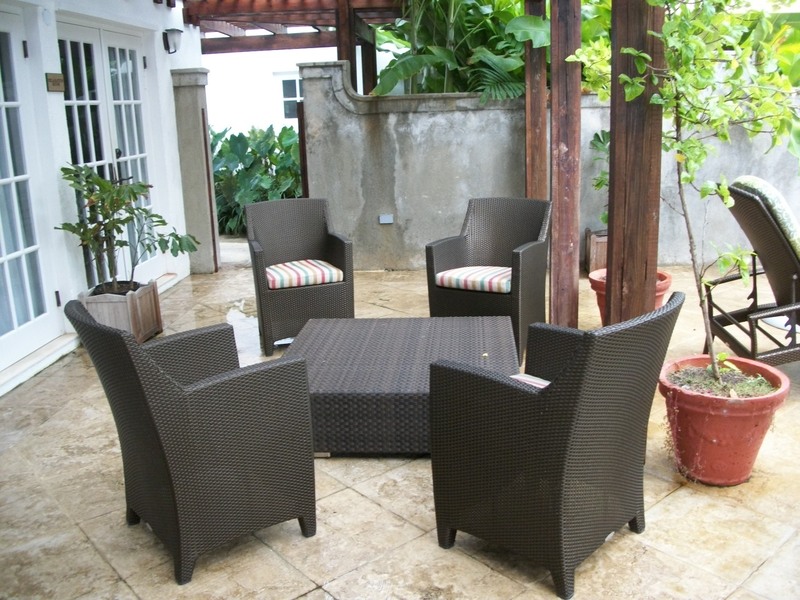 Arcadia II Terrace – Ideal for a small party, this Terrace overlooks the Caribbean. Maximum of 40 guests. When you are ready to plan the pefect destination wedding, give us a call at 310-722-3099 or send us a email at Lula@carterelitetravel.com and we’ll take care of all the details for you. Congratulations to you and your future spouse from Lula Carter at Carter Elite Travel!